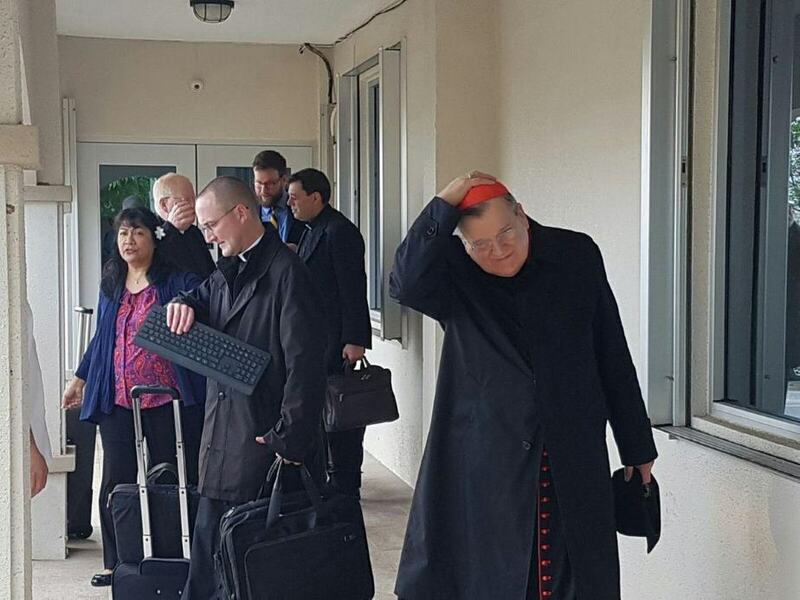 Cardinal Raymond Leo Burke, a canon lawyer and former head of the Vatican’s supreme court, is the designated judge for the tribunal that will receive statements from accusers of Archbishop Anthony Apuron. 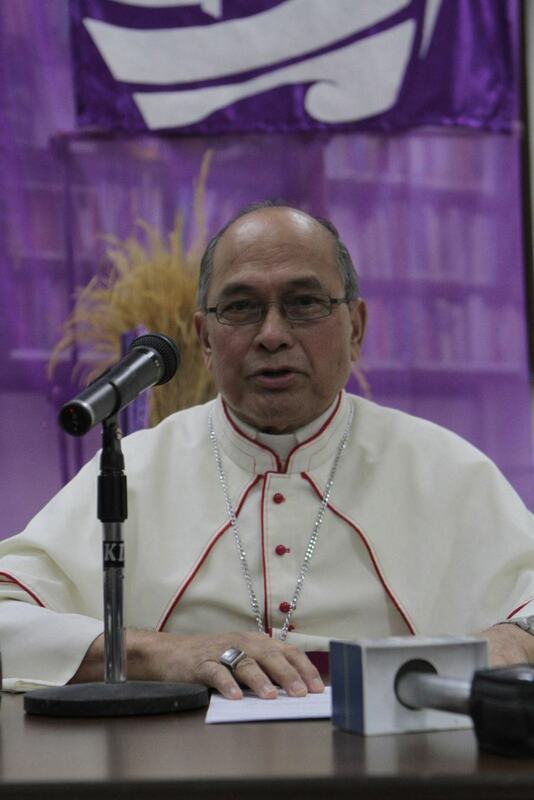 APURON: Archbishop Anthony Apuron is shown in this file photo from last year. A canon law expert said confidential documents obtained by the Post, which summon one of Archbishop Anthony Apuron’s accusers to appear before a Vatican-sent tribunal, are the first pieces of evidence that Apuron faces the church’s version of a criminal case, rather than an administrative proceeding. “These documents are a big affirmation that there’s at least a semblance of truth because they’re moving against Apuron,” said attorney Patrick J. Wall, a former priest and an advocate for victims of clergy abuse. “This is a criminal case. It’s the first piece of evidence that (they) believe he committed a crime of some sort.” Wall is with Jeff Anderson & Associates, a U.S. law firm recognized as one of the nation’s premier law firms to represent survivors of clergy sexual abuse. A Feb. 3 decree signed by Cardinal Raymond Leo Burke, who will be the presiding judge over the secret tribunal scheduled to take place at the Archdiocesan Chancery today, summoned Sondia to appear for “the purpose of giving said testimony,” according to the documents. Sondia is one of several former altar boys who accused Apuron of sexual abuse in the 1970’s. At the time, Apuron was a Guam parish priest. “This is so important. It is at the highest level of scandal when you have a bishop who is … going down as (an alleged) child molester. This disturbs everybody,” Wall said. Apuron has previously denied the allegations, and was recently found by private investigators living away from Guam and far from the Vatican trial. He was found last month in the California suburb of Fairfield, San Jose, near San Francisco. The Archdiocese of Agana continues to support him financially because he hasn't been proven guilty, according to the archdiocese. The trial’s equivalent of a prosecutor, as well as an advocate for the accused, are also expected to be at today’s secret proceeding, “so that they may assist” in receiving Sondia’s testimony, according to the documents. Rev. Justin M. Wachs from South Dakota, the Congregation for the Doctrine of the Faith notary, will take all of the notes and testimony during the secret proceeding and ensure he gets Sondia’s signature on pontifical documents. According to the Vatican, the Reverend Promoter of Justice is Robert Geisinger of Chicago. In Vatican penal proceedings, the promoter of justice brings the accusation on behalf of the Church, and prosecutes it before the tribunal. Wall pointed out that the Vatican sent tribunal participants who are U.S. citizens. “These are all American citizens. We’re talking about Justin from Sioux Falls, Burke who was a bishop of Wisconsin, Bob Geisinger from Chicago, it’s not like an Italian invasion,” Wall said. The canon law expert said he doesn’t think any member of the bar in the United States has ever questioned Vatican judges or lawyers in these types of proceedings. “I don’t think anybody has ever challenged it before because it was always done in secret,” Wall said. Because the canonical trial process is so secretive and his client is expected to provide testimony without his attorney present, attorney David Lujan said he will demand answers before he considers letting his client speak with the tribunal today. Lujan represents Sondia in a separate civil case filed in the District Court of Guam, seeking $5 million in damages against the Archdiocese of Agana, and by extension the Vatican. The tribunal documents obtained by the Post also show the protocol number and year for Apuron’s case. The significance of the case designation, according to Wall, is that Apuron’s case was the 197th case brought to the Congregation of the Doctrine of Faith in 2008. He said this means there were 196 other clerics, priests and deacons who faced complaints of child sexual abuse brought to the tribunal. The documents obtained by the Post offer a rare glimpse into the traditionally secret way of dealing with accusations against bishops and other officers of the church. “We have had two papal administrations now who have failed to inform the faithful, inform the public, and to help local authorities in the pursuit of justice that now the Holy See is making themselves a public nuisance,” Wall said. The protocol number, Wall said, is much like a court criminal case and allows the Vatican to track all matters relating to Apuron, whose case is designated as Protocol No. 197/2008. With the document dating back to 2008, Lujan was shocked to know that the Vatican has known about his clients’ alleged abuser for nine years and not taken any action to seek the complainant until recently.